The only high-quality raw material is used for preparing the offered lot and we make sure that it is sourced from the trusted places and that too after complete quality confirmation. We are associated with renowned transportation providers to ensure delivery of consignments is carried out without a glitch and in a timely manner. 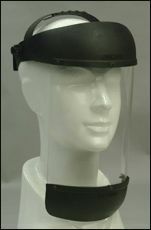 The Safety Faceshield, provided by us, is long-lasting and is known for its superior quality.